Trail users have great cause to celebrate! After years of ongoing effort by the ACTRWG and others, following recent intervention by new L. A. County Parks & Rec staff, public access has finally been restored to the Pinecrest Trailhead! 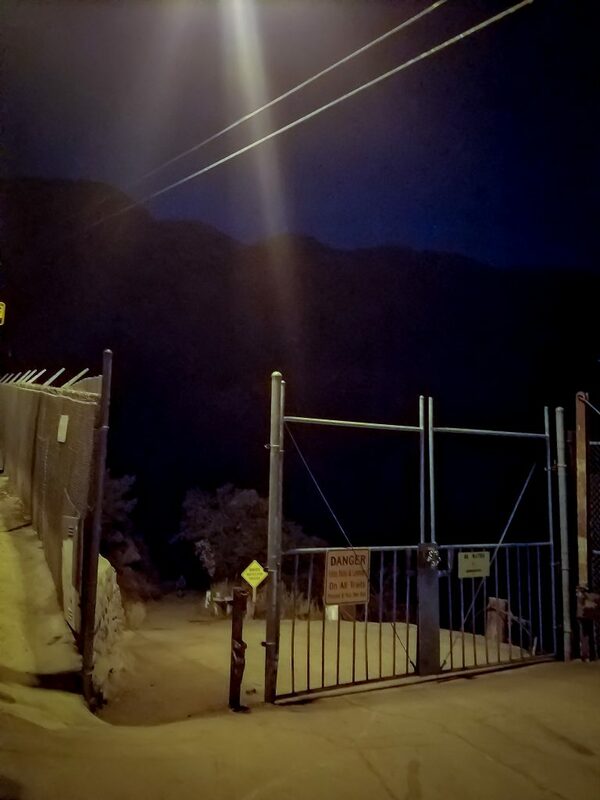 For many years a razor-wire fortified, neighbor-controlled metal Gate has locked in / out numerous hikers, dog walkers, backpackers, bicyclists and horse riders. This hazardous situation was finally remedied by the County a few days ago when the metal pedestrian gate was removed! See attached photo. Access will remain closed to unauthorized motorized vehicles on the fire road beyond the Pinecrest Gate. Hopefully, the remaining visual blight caused by unnecessary penitentiary-style fortifications, including dangerous razor wire and welded metal paneling, will also be removed soon. Thank you to all those who have worked so long to get the Pinecrest Gate reopened, particularly ACTRWG “regulars” Mitch M., Kevin S., Steve M., Marietta K., and Lori P, and the County Parks and Recreation staff. Enjoy the scenic vistas and trails beyond the Pinecrest Trailhead! With return of public access, trail users are encouraged to respect neighborhood peace and quiet when entering or leaving at Pinecrest and to only park in legal parking spaces that do not block adjacent driveways. Please report any hazardous or inappropriate activity to the Altadena Sheriffs, as you would for any location along roads and trails in Altadena. 0. Introductions for new attendees: Steve Messer, Rob Staehle, Lori Paul, Marietta Kruells, Zachary Likins (LA County), Kevin Singleton, Michelle O’Connor, Mitch Marich, Dorothy Wong. 3. Review Minutes and Action Items from June meeting. Not ready for review. Held until next month. 4. County / City / U.S. Government Announcements of any items not covered later on agenda. No new items announced. 5. Any serious new trail conditions or problems requiring immediate attention (firsthand reports strongly preferred; photos much appreciated)? Nothing reported. A. Responses to letter regarding recommended trail restoration, corrections & improvements (action from prior meeting and field visit). a. Resuming progress in restoring the historic Altadena Crest Trail. b. Correcting new trail signage. County is looking at correcting the monument sign for Loma Alta to include the word Trailhead as it was historically. c. Restoring trail segments on the County’s ACT map and trail website; including the crib trail north of the gymnasium. Zach GPSd the alignment recently and found the existing trail encroaches on La Vina homeowners assn property. County needs to pursue an easement to consider the trail official. Also need to coordinate with County legal department on current state of lawsuits. d. Ongoing closure of the Pinecrest Gate. Zach reports that his Department is going to recommend to Pasadena Water and Power the removal of Pinecrest gate and reestablishment of uninhibited access for pedestrians, bicycles and horses. This group wants to ensure anything built there will be suitable for horses to pass through. This group prefers removal of the gate, to prevent any restriction of access by nonmotorized trail users. e. Lincoln Avenue Roadside route from Loma Alta Park South to Altadena drive and from there to Hahamongna Watershed Park; Enhance safety for trail users as well as Aveson Charter Schoolchildren on their daily group walks to and from Loma Alta Park adjacent to traffic on Lincoln. DPW Roads Division was consulted about Lincoln Ave bridge. Possible alternatives include: Wayfinding signs, combining sidewalk and trail. No easy way to provide a trail along the shoulder; not enough room for both recreation easement and road right of way. DPW is considering sidewalk access on east side. This group would like to see a DG path on the east side, suitable for horses and people. There is an empty lot and a drainage that may provide an opportunity for a new trail to get kids and horses off the road, ending behind Aveson school. f. Proposed Shady Lane connection to the ACT along Loma Alta under existing trees to improve safety for trail and park users, including crosswalk improvements at Sunset Ridge Road. Field visit a few weeks ago. Department agrees with recommendations to make this trail official. Met with flood control district, and they are receptive to having the trail. Development division is doing a conceptual plan. Concept plan will be brought to this group before implementation. Concept plan is a month away, possibly next meeting. Will need to amend Parks Dept. use agreement with Flood Control to expand Loma Alta trailhead staging area to include Shady Lane trail. Funding has not been identified. B. Restore full equestrian use and amenities to Loma Alta Equestrian Park, Trailhead and Staging Area. a. Remove signs excluding horses from south side of the Equestrian park where the bathroom and drinking fountains are located. Discuss re-opening of small restroom at Trailhead & Staging Area on north side of Loma Alta. b. Replace dead trees in the Loma Alta Park Trailhead & Staging Area, including the recently killed White Alder (only trunk stum remains). Require adequate care for new and existing shade trees. c. Move concrete picnic tables out of direct sun to shade under trees or provide shade armadas over the tables. Tables are no longer shaded and are hazardously hot during the day. Need a site visit at the right time of day (noon). 1) Hahamongna. City of Pasadena maps showed County-owned easements in Hahamongna, but County does not have all easement records, and not all easements are on assessor’s maps. Zach spoke to Lauren Pluth, City of Pasadena. He has no issue with County trails in the park. The county would like to make a formal agreement with the City. Will figure out what type of agreement is needed to ensure the future of the County trails in Hahamongna in perpetuity. Potential for a trail junction hub was brought up, but Pasadena has little interest in the project, despite Rosa Laveaga’s initial enthusiasm. This group needs to decide where such a junction would go and advocate for it. 1) Camera that was at intersection of Rubio and Camp Huntington trail is no longer there. 1) Steve to get MWBA USFS MOU copy for County. 2) Lori to send County Biologist contact info to Zach.3) Lori and Marietta will meet with Lauren, Rosa and Zach to discuss Hahamongna Trail Hub. 4) Organize site visit to determine where to move two picnic tables in Loma Alta Park. 10. Upcoming Events: The next ACTRWG meeting falls on Tuesday, 2017 August 8 (2nd Tuesday of each month, unless cancellation is announced, 7pm at the Altadena Community Center). 11. Adjourned at 8:30 p.m.
Review Minutes and Action Items from July meeting. Approved with corrections including spelling of Staehle, and Lauren Pluth. County / City / U.S. Government Announcements of any items not covered later on agenda. No new items announced. Any serious new trail conditions or problems requiring immediate attention (firsthand reports strongly preferred; photos much appreciated)? Homeless encampments at Millard and Gould Mesa, homeless are disturbing and threatening trail users. FS has a plan to deal with the problems (to be implemented). Responses to letter regarding recommended trail restoration, corrections & improvements (action from prior meeting and field visit). Lincoln Avenue Roadside route from Loma Alta Park South to Altadena drive and from there to Hahamongna Watershed Park; Enhance safety for trail users as well as Aveson Charter Schoolchildren on their daily group walks to and from Loma Alta Park adjacent to traffic on Lincoln. Zack talked to DPW, the easiest way to deal with it is to partner with DPW. DPW Doing feasibility study to place a sidewalk on the eastern side of Lincoln. Funding has not been identified. La Vina developer is asking for a zoning change, a possible source for mitigation funds to apply to this project. Proposed Shady Lane connection to the ACT along Loma Alta under existing trees to improve safety for trail and park users, including crosswalk improvements at Sunset Ridge Road. Concept plan for Shady Lane trail was presented by Zack, developed in-house by County. Need to consider watering of trees in our comments, location of crosswalk, stop signs, tree removal. a. Remove signs excluding horses from south side of the Equestrian park where the bathroom and drinking fountains are located. Discuss re-opening of small restroom at Trailhead & Staging Area on north side of Loma Alta. Park Superintendent at Loma Alta put up signs so equestrians would be directed to Loma Alta, but this inhibits access to the bathrooms by equestrians and bicycles. b. Replace dead trees in the Loma Alta Park Trailhead & Staging Area, including the recently killed White Alder (only trunk stump remains). Require adequate care for new and existing shade trees. To be discussed on 9/5 site visit along with picnic tables. c. Move concrete picnic tables out of direct sun to shade under trees or provide shade armadas over the tables. To be discussed on 9/5 site visit along with picnic tables. Pinecrest Gate. Gate was removed last Thursday, and some of the chainlink and razorwire has been removed today. Gate was on County property, not on Pasadena property. Two Pasadena Water supervisors Norman Lara and Vince Zamavoa were there to take down the gate. Kevin cleaned up debris, while a second crew arrived to continue removing material. If any problems, need to report them. County needs to get a written statement from Chris Klippert relinquishing control of the gate. This group needs to become engaged in the One Arroyo planning process. Organize site visit to determine where to move two picnic tables in Loma Alta Park. Site visit tentatively scheduled for 9/5/2017 at noon. Zack to determine if parking restrictions on Pinecrest are county-approved. Dennis to send a letter to County Parks supporting removal of Pinecrest Gate. Kevin to email Mitch to ask him to preserve list of people trapped by Pinecrest gate. Compile and submit comments on the proposed Shady Lane trail by August 22nd. Upcoming Events: The next ACTRWG meeting falls on Tuesday, September 12, 2017 (2nd Tuesday of each month, unless cancellation is announced, 7pm at the Altadena Community Center). 3. Review Minutes and Action Items from March meeting (thank you Steve Messer!). Approved unanimously. 4. County / City / U.S. Government Announcements of any items not covered later on agenda. No report. There is talk of the Forest Service divesting itself of Cobb Estate, and negotiations are apparently underway with the County and other potential partners. 5. Any serious new trail conditions or problems requiring immediate attention (firsthand reports strongly preferred; photos much appreciated)? 1) Mitch Marich: Canon to Cobb Estate trail conditions report submitted in March; no response from Zachary Likins/LA Co. Park & Rec. 2) Mitch Marich notes there are many slides and some cross trail ruts on segment from Eaton Canyon to Zane Grey but have not had time to write a formal report. 3) Chaney Trail to end has been graded. A. Letter regarding Crib Trail (action from prior meeting). Draft letter was reviewed. Recommendation to submit letter and follow up with a meeting. Increased use of e-mountain bikes on local trails (USFS and County). The USFS considers all e-bike classes to be “motorized;” therefore, e-mountain bikes are permitted only on motorized OHV (Off Highway Vehicle) trails on Federal land, not on multi-use nonmotorized trails. See USFS determination letter. We need to request clarification for County trails. California AB1146 made e-bikes legal for use on roads, and also on trails if the land manager has not taken action to prohibit them. iv. Restore Crib Trail Segment N. of Gymnasium (see 6.A. above) – Trailhead has been placed in the wrong place, draft letter written to County outlining the problems with the trail and associated signage; draft letter approved. v. Restore driveable-in-emergency fire road from Millard Campground to the top of Lincoln Ave.
vi. Remove encroachment at 3636 Skylane Drive on Canon. Update: the trail is being blocked by sweepings from the property owner’s stable. vii. Get 200’ fence in compliance from segment of ACT above Windfall Ave. No update. viii. Create well-marked and publicized trail hub/junction in Hahamongna Watershed Park. not have a County easement, unknown if it is a FS trail: LAWC Board meeting coming up. Suggestion to attend the board meeting. iv. Replace dying Coulter Pines at the Loma Alta staging area. Proposed “shady lane” connection for the ACT along Loma Alta under existing trees to improve safety for trail and park users. i. Cobb Estate Rumors: Is the USFS attempting to divest its interest in Cobb Estate? If so, what’s the plan? 1) Set up a meeting with Sussy Nemer/Zach Likens to cover Crib Trail, trail map inconsistencies and omissions, proposed shady trail. 10. Upcoming Events: The next ACTRWG meeting falls on Tuesday, 2017 May 9 (2nd Tuesday of each month, unless cancellation is announced, 7pm at the Altadena Community Center). 11. Adjourned at 8:00 p.m.
Attendess: Robert Staehle, Lori Paul, Robert Ettleman (Los Angeles County), Steve Messer, Marietta Kruells, Aron Tschida (Boy Scouts). Desired Adjournment time for this meeting? Called to order at 7:07 pm. Desired adjournment at 8:15 pm. Decision on meeting Secretary & recorder of action items. Steve Messer will serve as secretary. Review Minutes and action items from December meeting. Approved with a note to differentiate Robert E. and Robert S when referenced in the minutes. Any serious new trail conditions or problems. viii. Create well-marked and publicized trail hub/junction in Hahamongna Watershed Park. Possibility of doing it as an Eagle Scout project. xii. Dying Coulter Pines at the Loma Alta staging area. Review of task list for the next meeting. Task List carried from previous meeting: Lori will call Graham about LAWC pipeline. Robert E. to look for Skylane gap easement in Sapphos report. Marietta will connect Arron and Rosa to discuss Hahamonga Hub. Suggest attending Hahamonga Watershed Park Advisory Council meeting. Upcoming events: The next ACTRWG meeting falls on Tuesday, February 14, 2017. On Wednesday, January 18 in the Donald Wright Auditorium of the Pasadena Central Library, the Arroyo Seco Foundation will hold a public meeting to examine the County’s Hahamongna big dig plan and the issues involved in the lawsuit. 1. In attendance: Robert Staehle, Lori Paul, Robert Ettleman (Los Angeles County), Steve Messer, Marietta Kruells, Aron Tschida (Boy Scouts). 2. Desired Adjournment Time: 8:15. Steve Messer will serve as secretary. 3. Review minutes: October 2016 minutes approved with a note to differentiate Robert E. and Robert S. when referenced in the minutes. 4. Los Angeles County: Robert E. has composed a letter to property owner at 3636 Skylane drive stating County is aware of their encroachments, and they must be removed within 30 days. Letter will be sent next week. Robert E. knows about the Crib Trail. Rubio-ACT relocation project will move trail alignment off the roadway shoulder in Rubio canyon. Have easement from MRCA, working on easement from AFC; have an agreement with Rubio Water, and from four property owners. ACTRWG will approach Sameer to get clarification of the property sale agreement specifying that there will be easements. Furniture dumped at the end of Canon drive, has been picked up. 5. Serious New Trail conditions. Trees down on Sunset Ridge and Gabrielino were removed by volunteers. Encroachment at 3636 Skylane Drive; homeowner has been contacted by LA County. Restore driveable-in-emergency fire road from Millard Campground to the top of Lincoln Ave. Create well-marked and publicized trail hub/junction in Hahamongna Watershed Park. Possibility of doing it as an Eagle Scout project. Remove “dropped” (abandoned) pipe on Chaney Trail, from Coulter reservoir to Chaney Trail. Does not have a County easement, unknown if it is a FS trail. Dying Coulter Pines at the Loma Alta staging area. 7. Other Old Business: Los Angeles Conservation Corps has completed another short section of the Gabrielino trail above Oakwilde. Work to resume next year. 9. Task List: Lori will call Graham about LAWC pipeline. Robert E. to look for Skylane gap easement in Sapphos report. Marietta will connect Aron and Rosa to discuss Hahamonga Hub. Suggest attending Hahamonga Watershed Park Advisory Council meeting. Upcoming Events: Next ACTRWG meeting will be Tuesday, January 10, 2017 at the Altadena Community Center. Festival of Lights Hike from Cobb Estate on Sunday, Dec 18 (subsequently cancelled). Meeting adjourned at: 8:12 p.m.
1. In attendance: Mitch Marich, Robert Staehle, Lori Paul, Steve Messer, Marietta Kruells, Robert Ettleman (LA County), Arron Tschida (trail runner). 2. Desired Adjournment Time: 7:45. Steve Messer will serve as secretary. 3. Review minutes from September 13, 2016 meeting. Minutes were not available for review. 4. Los Angeles County: Robert Ettleman displayed a photo of the ACT at Canon Blvd, near the Village Playgarden. They were encroaching on the ACT easement, and an adjacent property. Lori has notified Sussy Nemer. Robert will send a letter to the property owner. Were considering an “end of county maintained trail” sign, but easement continues. USFS: Pilot program shuttle service from Arcadia Gold Line Station to Chantry was well-utilized over the past three weekends carrying over 100 people per day. 5. Trail conditions. No new problems reported. Steve surveyed the Gabrielino for trailwork. The Forest Botanist must wait until spring next year before she can survey the trail and sign off on the work. Chaney Trail connector to the ACT with Lincoln Avenue Water Company does not have a county easement. Erosion along the pipe is worsening. 6, A. Fire Season road maintenance. Maintenance budgets are being cut, and fewer roads will be maintained in the coming fiscal year. B. Re-grading of ACT. Over the past few meetings segments of the ACT have been identified where a small amount of maintenance will prevent major damage in the coming winter. Suggestion to use the County trails web site to report problems and maintenance needs. Trail maintenance is reactive, no maintenance plan exists. County is trying to establish a maintenance plan and increase funding for maintenance. C. Chainlink Fence. No new reports. D. DPW Devil’s Gate Reservoir sediment removal. No new reports. E. La Vina Litigation: Trail alignments have been determined, including line of demarcation between what SMMC will own and La Vina Homeowners will own. There is to be a conservation easement owned by the SMMC, on land owned by the LVHA, between the proposed trail and the homeowners. Land on the other side of the trail will go to SMMC. F. Rubio Canyon Gateway trail planning. County has expended funds towards three property owners, acquiring easements; an overlay easement from MRCA. They are asking for an easement from AFC as well. The proposals would remove four street crossings that don’t have crosswalks. Also trying to get an easement from Rubio Cañon Water Company. G. Pinecrest Gate: No new reports. H. Old Crib Trail. Robert presented a draft letter regarding the Old Crib Trail, asking for it to be put back on the trail map and signed. People are using it, though it does not have official trail status. Should be signed “Crib Trail.” Related, the bathroom is usually locked, but could easily be opened by Loma Alta park staff. Motion made to approve the letter, with the addition of explanatory maps by Steve, approved unanimously. I. Loma Alta Trailhead & Staging Area. No new reports. Old Business: Draft a letter regarding the Lincoln Ave Water Company pipe on Chaney trail to Ranger Blount. New Business: San Gabriel Mountains National Monument Management Plan public comment period was extended until November 1st. Collaborative comments will be shared for review with this group. This Thursday, McDonalds at Lincoln and Woodbury will be a Coffee with the Captain Vicki Stuckey, Altadena Sherrifs Captain. Robert will send a letter to the property owner encroaching on the ACT at Canon Blvd. Lori and Rob to add a map to the letter before sending. Get comments on the Draft Collaborative letter to Steve. Task List carried from previous meeting: Mitch to complete maintenance needs report for Olga. Marietta: Send a written request to reinstate the Crib Trail into the County’s trail inventory, and bring it back up to County trail standards. Include that we were promised a route around what is now the site of the Gymnasium on the west side of Sunset Ridge Road. Steve: Draft a letter regarding the Lincoln Ave Water Company pipe on Chaney trail to Ranger Blount. Upcoming Events: Next ACTRWG meeting will be Tuesday, December 13, 2016 at the Altadena Community Center. November meeting will be cancelled due to election day. 1. Introductions for new attendees. Mitch Marich, Robert Staehle, Lori Paul, Steve Messer, Dennis Merkel (USFS), Marietta Kruells. 4. Review Minutes and Action Items from June meeting (thank you Steve Messer!). Approved unanimously. 5. County / City / U.S. Government Announcements of any items not covered later on agenda. USFS: Dennis reported that: court settlement is finalized, so adventure passes are being reinstated according to the terms of the settlement. Fee areas include toilets, trash, parking, signs, picnic tables, information kiosk, patrols, and/or trailheads. Fee areas are within a half mile of these amenities. Identified by yellow and blue “US Fee Area” signs. National Public Lands Day is on September 24, but a volunteer service event will be held on September 20 at Chantry Flat. A pilot shuttle program will be run from Arcadia Gold Line Station to Chantry Flat on September 24 (National Public Lands Day), and 25, then October 1 and 2, and October 8 and 9. The shuttle is free, no reservations are required. 6. Any serious new trail conditions or problems requiring immediate attention (first-hand reports strongly preferred; photos much appreciated)? No new emergencies, but Mitch reports that somebody put in a bypass on Sunset Ridge trail, just above the cabins, that avoids the steep steps. The new route seems to be preferred by the public, but is unofficial. Keith, the former campground host at Millard has moved on, and a new host is now there, Steve Sims, transferred from Gould Mesa..
a) Fire Season Road Maintenenace: Maintenance budgets are being cut, and fewer roads will be maintained in the coming fiscal year. Contact the Forest Service Engineer to request a road be maintained. b) Re-grading to new County standards for erosion control on vulnerable ACT segments. Mitch is putting together a report including where maintenance is needed along the ACT. c) Update re: New fence erected along ~200-foot segment of ACT above Windfall Ave (E. of Rubio Gap and Stonehill). No new reports. Still need to determine whether the fence is on the easement or on the private property. d) DPW Devil’s Gate Reservoir (Hahamongna Watershed Park) / ACT Trailhead / Recreation impacts? There is a Fifth District Supervisor’s Candidate Debate on the issue, Thursday, September 15, 7 pm, Creveling Lounge – Pasadena City College, 1570 East Colorado Blvd., Pasadena. e) La Vina litigation resolved: One of Marietta’s attorneys in the case has since retired. No new reports. g) Update on locked Pinecrest Gate. No changes to report. h) Old Crib Trail, now disappeared from County ACT maps and web site. At a previous meeting we found that the historic Crib trail between Sunset Ridge and Lincoln has been removed from maps and the County trails web site, though it still exists on the ground. Motion made and approved: Send a written request to the County, to reinstate the Crib Trail into the County’s trail inventory, and bring it back up to County trail standards. Include that we were promised a route around what is now the site of the Gymnasium on the west side of Sunset Ridge Road. i) Loma Alta Trailhead & Staging Area. Drinking fountain needs to be repaired. Horse trough has been replaced, but not with the optimal design. Coulter pines and walnut in the staging area and catch basin are dying. They need larger basins. Irrigation tubing has been replaced, but the basins around the trees are not large enough. There is a bathroom in the parking lot that is not functional, and would serve the trailhead and the equestrian community. 8. Other Old Business: Motion made to Draft a letter regarding the Lincoln Ave Water Company pipe on Chaney trail to Ranger Blount. 9. Other New Business: San Gabriel Mountains National Monument Management Plan public meetings are being held this week. Public comments are due by October 17. Mitch to complete maintenance needs report for Olga. For future reference, need to give at least 24 hours to the County notice if a meeting will be cancelled. Dennis to write a report outlining the status of item 7C, the chainlink fence along ACT. 11. Upcoming Events: The Next ACTRWG meeting will be Tuesday, October 11, 2016 at the Altadena Community Center. 12. Adjourned at: 7:58 pm.